Posted on December 18, 2012 by Yohan. This entry was posted in Uncategorized and tagged data analysis, experiments, fMRI, localization, neuroscience, statistics. Bookmark the permalink. What’s your take on the neuro-economics field? People working here wish to trace elements of “utility” to brain “readings”, to give empirical content to the notion of utility. It seems a little difficult to digest, and one point of observation I often encounter is that such readings are hard to map on to any “feeling”, the data is really noisy. As you might expect, I’m quite suspicious of neuro-econ. It’s a trendy sort of field, and makes precisely the kind of mereological fallacy-type errors I mention here. They like dopamine because they think it will tell them about “value” or “preference”, but the data are not so simple. Noise per se is not the issue, it’s the physical meaning of the data that is subject to a variety of interpretations. There are so many links and nonlinearities connecting brain areas that these abstract ideas like utility — or beauty, or political leaning — tend to involve a gross overextension of the inferred role of some brain area. Each experiment is like a 2D shadow of some complex 3D object. Or even higher D. 🙂 One can’t try to infer too much from a single set of dimensionality-reducing projections. Great metaphors, but your criticisms are not specific to fMRI. In your hypothetical example, the torso is involved in batting but not differently for hits and misses. If, instead of doing signal averaging, you examined the relationship of hight and hand size to batting (using t-tests), you might find that height is related but not find the same for hand size. (As with all traditional frequentist inferential parametric statistics, not finding significance for hand size could be due to comparatively high variablity or a small effect.) Even if the relationship between hand size and pitching ability is really very small, it doesn’t mean hands aren’t used for pitching. As you say, only what is different about the batter’s technique is highlighted, but this is true for any t-test. Next, individual differences get blurred out with any statistic. This applies to the hands and height example, but also to the often reported statistic the men are better at mental 3D block rotation than women and women are better at word generation than men. Those results are true for the average, not universally (as you could say that blue whales are bigger than humans, but men are not universally taller than women). I think your metaphors are great if you ever teach statistics for any field you should employ them. You say that fMRI results only reach statistical significance if the studies are carried out in groups. This is not quite right. Almost all fMRI studies begin with a “first-level analysis,” which are single-subject statistics. This way you can contrast different conditions for a single subject. With large differences, small variablity, and enough trials, robust maps can be created. This is done for surgical planning when doctors are considering how much brain they can resect surrounding a tumor without endangering someone’s ability to move or talk. When examining mean differnces between groups, however, you need to examine results from multiple people (“second-level analysis”). Again, this is not specific to fMRI. The rule of thumb goes something like this: Most people are interested in being able to detect differences with effect sizes of about 1 SD or above. To do this with some confidence (Type II p < 0.20) you need about 10 to 30 observations per group. Also, your post refers to the most common method of fMRI analysis, task-based GLM. However, I think that ICA and other multivariate approaches that take into account the relationships of voxels to each other are the best methods and are being utilized more and more as the field advances. Further, new methods are looking at temporal dynamics instead of looking at the average state of the brain over the time spent in the scanner. I'm excited to read your next post! Thanks for the comments and criticism Kayle! Very helpful! And feel free to use these metaphors … and if you improve on them, let me know! I did realize as I was writing this that the data analysis criticisms are not specific to fMRI, hence the last paragraph. I’m more interested in the relationship between blood flow, oxygen, metabolism, and firing, which I intend to talk about in the next post. But the details you provide are definitely worth mentioning clearly. As a point of clarification — ICA and other methods still need to use subtraction (or normalization) before doing anything else, right? Also, re: single person MRI. What you mention is structural, right? I’d be excited to see a study done just on one person — perhaps longitudinally over weeks and months, on the same task. Do the stats allow that? Re: temporal dynamics. You’d still need to average across trials though right? If you see any new methods that a non-specialist might be interested in (and understand! ), share on g+ etc! In fMRI methods, “pre-processing” refers to a specific set of procedures used to reduce artifacts and improve data, such as slice-time correction, temporal and spatial smoothing, and co-registration. ICA does not necessarily use subtraction or normalization. I wasn’t referring to structural MRI. Every fMRI result you’ve seen includes single-person single-session results that generally are not reported because most people aren’t interested. I’d be happy to show you data on one subject. Longitudinal analyses are easy to do, but you have to be careful because there are a lot of potential pitfalls (eg, you can’t use a different scanner). Yes, for temporal dynamics you need to average across observations (trials or TRs). The time window you choose plays a big role in the dynamic you’re investigating. 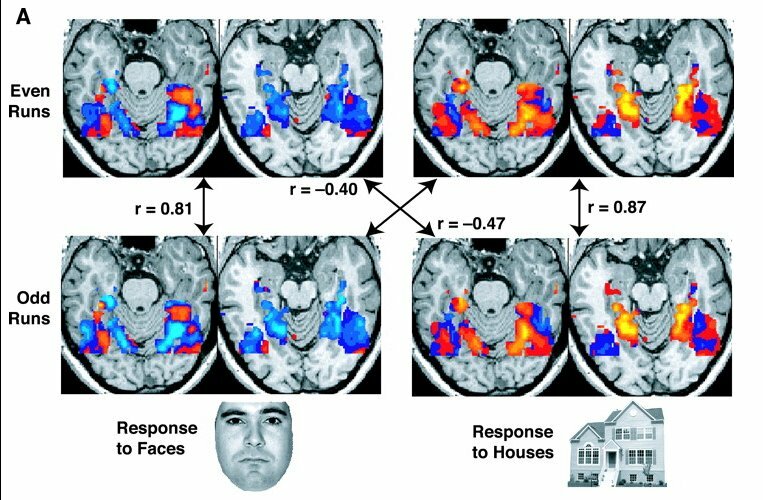 It’s an awesome new part of fMRI! However, to get good results you need many observations (short TR) and high SNR from your magnet. Cool! Good to know. Very curious about how ICA manages without subtraction or normalization. Isn’t there a need to find a zero point for any measurement? How else does one calibrate? I’ve quoted you on some key issues in the form of an edit at the bottom of the post. Must try to be fastidious about these things! I’m still learning about ICA when it comes to fMRI, but if I find out more about zeroing, subtraction, or normalization, I’ll let you know. My understanding though is that you use the time series for each voxel with the BOLD values reported by the scanner. But at this point, there is more that I don’t understand about ICA than there is that I do. Thank you for your posts and blog. Are you a nero-student or professor? I’d love to know more about you. My daughter is getting her Ph.D. in cog. sci at UCI and I have shared your blog with her and am sending your G+ id.